I experienced many mystical visits from the Dragonfly this fall. One afternoon, a Dragonfly landed on my arm, and right on top of my Owl tattoo, resting there for quite a while staring right at me. The following morning, a song arrived, and I soon learned that it was a Dragonfly Medicine Song. The Dragonfly had quite a few things to teach me about letting go, transitions, and not resisting life’s flow. In the process of composing this song, I became a student of Dragonfly medicine. I was also being prepared for some big transitions unfolding. Sometimes seeing a Dragonfly may foretell a time of great change and transition. The first thing that usually happens when a big change is due, is that we put up lot of emotional energy into resisting what’s coming, even though on a mental level we may understand that change is very much needed. 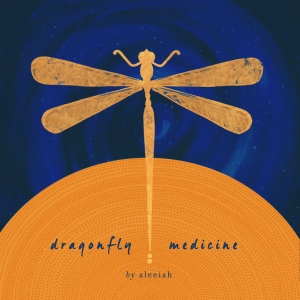 Dragonfly is an especially helpful guide and ally for those who are resisting change that is overdue, and can teach us to go through change without kicking and screaming. Dragonflies mature in water, in a nymph like state before they go through a magical metamorphosis, grow their wings and then take to the air. They dwell in the realm of water for the first part of their lives. This speaks of working with our emotions and subconscious mind, as well as spirit. It can also teach us about maturity, and balancing of our mental-emotional nature. Repeated encounters with Dragonflies may signal the need to open the gate of shutdown emotions. The Dragonfly can show us to not hide our light and true colors. Often people who carry Dragonfly as their totem animal grew up being highly sensitive and clairvoyant. Later on as an adult, they may have learned to shut down their abilities for protection. Dragonflies have exceptionally acute eyesight and perception, and they literally see beyond the veil – a powerful totem to carry for anyone working in the realm of mediumship, counseling, or intuitive healing. Dragonflies have many remarkable abilities. They have two sets of wings. If they lose one pair they can still fly with the other. They can twist and turn, move up or down, or change directions in an instant, and even fly backwards at incredible speeds. Superior adaptability is one of the many gifts of the Dragonfly, and people with Dragonfly totem are no strangers to quick adaptation. The oldest discovered fossils of very large Dragonfly relatives are estimated to be over 300 million years old – older than Dinosaurs! If there is any creature that knows the secrets of earth and its history, it is the Dragonfly. The Dragonfly owes its long survival to skills of resilience and magical adaptation. Working with Dragonfly medicine can assist in adapting to new life changes more quickly, as well as healing ancient ancestral patterns. 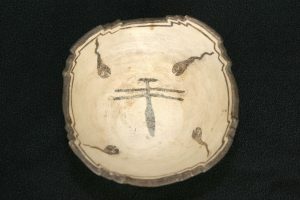 Old Zuni pottery with Dragonfly. The iridescent wings of the Dragonfly reflect light in a mesmerizing way. In many cultures, Dragonflies are associated with light, wisdom, strength, and enlightenment. For the Hopi and Zuni tribes, Dragonfly was considered a powerful healer spirit. Dragonfly was often called upon in medicine ceremonies. The Hopi believed that Dragonflies have great healing powers, and included Dragonflies in their prayers and ceremonies. Dragonflies are portrayed on many Hopi and Zuni petroglyphs, jewelry, and pottery. In Japanese culture Dragonfly is much admired and respected, and frequently included in traditional Japanese Haiku. To the Japanese, Dragonfly represents joy, strength, and happiness. The Samurai used it as a symbol of power, agility, and victory. Japanese warriors in the 17th century adorned their helmets with Dragonfly motifs to give them strength and protection. Connection to nature spirits and dream work are associated with Dragonflies. The Irish used to say that Dragonflies were the “horses of faeries”. Seeing a Dragonfly meant a faerie was definitely nearby. Owl medicine and Dragonfly medicine are connected. Both creatures can help us work through life-death transitions, and see through our illusions. The Owl works primarily in the realm of shadow, while Dragonfly works with the power of light. Both are needed. The Dragonfly often arrives first to inform of us when change or transition is needed. The Owl may then take over any work that crosses over to the next realm, sometimes beyond death. When Dragonflies started appearing for me this fall, I soon learned that my grandmother was about to pass. In my research on the meaning of Dragonflies, I discovered many Dragonfly stories from around the world that involve transitioning between dimensions. Swedish folklore tells that Dragonfly weighs the souls of those who are about to cross over. For some Native American tribes Dragonflies were seen as emissaries for souls that had passed. It seems the Dragonfly often arrives when the veils between the worlds are thin, and a transition is due or about to take place. I believe part of their purpose is to inform us of impending change. The essence of Dragonfly’s teachings are about change and transition – looking at our beliefs, habits, and ancestral patterns that need shifting. Working with the spirit of Dragonfly is also very connected to power of light; it asks us to shine our light, fearlessly. Light as medicine, allowing more light into our lives, shining light to our darkness, all fall under the territory of Dragonfly’s guidance. With its power of light, the Dragonfly can help illuminate difficult emotions that are buried deep within. If you choose to call upon the spirit of Dragonfly to assist your journey, be ready for a shift in perspective. Dragonfly often shows us that things are not as they seem. Look behind the veil of mind created illusion, and be willing to shed some old beliefs. Call upon the Dragonfly for help with transition and when you need the power of adaptation, strength, and resilience to go through big life changes. This song holds vibrational medicine for those who may be resisting change. It helps in connecting with deep waters of emotions that may have been numbed out, and now need to be fully felt before healing can occur. It also contains the energy for healing ancestral wounds. The full story behind this song can be found here.